Long after everyone else went home, Mario Mazzoni put on a pot of coffee and settled in for another Tuesday night at his small office overlooking Bleecker Street. 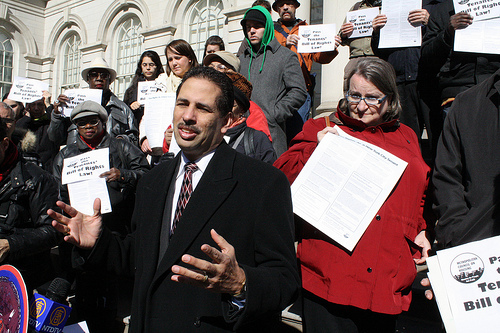 As executive director of the Metropolitan Council on Housing, one of New York City’s oldest tenant advocacy groups, Mazzoni spends most days dishing out advice to people fending off bedbugs, noisy neighbors and the occasional crooked landlord. But lately, his nights have been dedicated to organizing tenants who are caught up in a different battle—one which few realize they are fighting until it’s too late. The council is seeking to put an end to the so-called tenants blacklist, a term for the list of people targeted as unsuitable tenants due to a past history in housing court. The list is created by private tenant screening companies who first pay the New York State court system for access to the housing court’s database, then sell that information to landlords who can request reports on people looking to rent apartments. The tenant screening reports—which are usually available for less than $50—have become a common tool for landlords looking to filter out potentially risky tenants. But Mazzoni said deserving renters are too often denied housing due to inaccurate or misleading information in the reports. The council is currently searching for plaintiffs to testify in a federal civil rights suit it plans to bring against the state court system. If it prevails, the suit will block the sale of court data—a practice the group claims violates a tenant’s right to due process of law. While the blacklist is not new to New Yorkers, its presence in the city is growing. Louise Seeley, executive director of Housing Court Answers, a service of the City Wide Task Force on Housing that offers advice and information to tenants involved in housing court procedures, estimates that 125,000 defendants wind up in housing court’s database each year, which keeps records on file for seven years. Screening companies can pull up any of those cases for landlords. While using screening companies to do background checks may be easy, Seeley said reports are sometimes inaccurate. Most do not explain why a person was taken to court, nor do they disclose the outcome of a case. In some instances, people who go to court to demand repairs or fight overcharges end up on the list. Other times, innocent renters get mistaken for housing court defendants with matching names. The threat of being denied housing in the future often prevents some people from confronting their landlords altogether, Seeley said, especially when it comes to standing up for their rights. Ramon Bellido, who has lived in his Harlem apartment for almost 30 years, said his building has been without heat all winter. Bellido, 58, said he’s tried to confront his landlord with little luck; he’s afraid to push the issue. He’s not alone. Sally Dunford, who works with the West Bronx Housing and Neighborhood Resource Center, an agency that helps residents in the area obtain repairs and settle rent disputes, said she regularly encounters people like Bellido who say they are afraid to stand up for their rights, fearing it will only hurt them in the long run. Still, landlords argue steps must be taken to protect property owners from tenants who could prove to be costly nuisances. Mitch Posilkin, general counsel to the Rent Stabilization Association, an organization that represents New York City landlords, said the screening reports are “absolutely essential” to determining the financial fitness of a prospective tenant. “The most important decision an owner of a rental building can make is to determine the reliability of the financial status of a prospective tenant,” he said. Posilkin admitted there are times when screening reports can be inaccurate or incomplete, but added that those cases are rare. He said building owners are just trying to avoid difficult and time-consuming court proceedings from happening in the future. Mazzoni said the council’s lawsuit will not prevent landlords from being able to access housing court data; it will just require them to seek out the information on their own rather than using a middleman. Other measures have been taken to help combat the blacklist’s influence in New York City. Last February, City Council enacted the Tenants Fair Chance Act, a law that requires landlords to disclose which screening companies they use for background checks so that tenants have a chance to clarify false or misrepresented claims. Yet Seeley said landlords aren’t likely wait for tenants as they try to clear up reports. Councilmember Fernando Cabrera proposed a law in February that would require all landlords to post a Tenants’ Bill of Rights in the lobbies of apartment buildings. The signs would alert residents to what they are legally allowed to demand of their landlords. Mazzoni said it’s a step in the right direction at helping deserving tenants feel more empowered and in control.